At Chironow Loveland, we specialize in the diagnosis and treatment of conditions concerning your neck and spine. Whether you are having problems due to an accident or another unfortunate situation, the smallest of problems can cause large issues if not treated properly. Poor posture, lack of exercise and even stress can all negatively affect your joints and the alignment of your back. This ultimately can cause you an immense amount of pain that only worsens with time. Situations like this are where the help of a chiropractor can be especially useful. Do not become a victim of your own suffering. Let our chiropractors at Chironow Loveland help alleviate your pain and let you live your life to the fullest again. Walk into our office today to receive our top-notch chiropractic services. Generally speaking, pain does not occur overnight. Many of our clients experience pain regularly and try to self-medicate the problem, not knowing the true source of their discomfort. It is our goal to work with you to diagnose the situation at hand and provide an effective solution. Headaches or migraines. 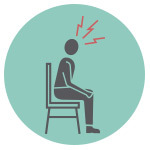 You frequently have a throbbing feeling and/or a feeling of tightness in your head and neck area. Sciatica. You have severe pains in your leg that may feel like a burning or shocking sensation that sends sharp pains down your leg. Shoulder, arm, wrist, and hand problems. 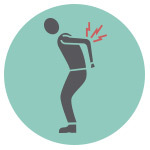 You’re experiencing uncomfortable aches and pains in muscles or joints in your arms. Hip pain. You have pains in your hips from overuse, trauma, arthritis or other types of inflammation. Neck pain. You have pains in your neck that won’t go away, that prevent you from doing everyday activities or have caused severe numbness or tingling sensations. Back pain. You have pains or stiffness in your back that are persistent, chronic or radiating to other parts of your body. You might also have the inability to stand up straight. Leg, ankle, knee and foot problems. You’re experiencing uncomfortable aches and pains in muscles or joints in your legs and/or feet. Chiropractic care can help relieve the aches and pains you feel from these issues, and our chiropractors can provide you with the chiropractic services you need to live your life pain-free. We’ve worked with patients of all ages, and we take pleasure in enhancing your life and your overall well-being. If you are experiencing pains in your body, we invite you to walk into our office on your own time. Let us evaluate your condition to design a treatment plan specific to your needs. Once you begin to feel better, we’ll continue to work with you regularly, offering exercise suggestions and recommendations so you can maintain your health and keep your body functioning properly and free of pain. There’s no appointment necessary, so stop by our office and visit our chiropractor in Loveland today. Many patients believe they only need to see a chiropractor after they’re already experiencing intense pain, but that’s not the case. There are a variety of situations in life that can call for the help of a chiropractor. Whether you’ve been in a major car accident or the stiffness in your neck simply won’t go away, a chiropractor can help reduce and mediate the pain. You sit for long periods of time at your job or perform repetitive tasks. These days, a lot of jobs require us to sit and stare at computer screens for prolonged periods of time. 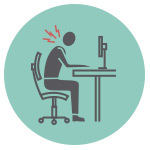 If you spend long hours working at a desk, you can develop poor posture leading to unwanted pressure on your neck, shoulders and back. Ultimately, this puts pressure on your bones and discs and can result in obnoxious pain. A chiropractor can realign your spinal column to its proper condition, reversing any damages from your normal, day-to-day tasks. You have chronic pain in your muscles and/or joints. Instead of heading to your local drugstore for temporary over-the-counter relief, a chiropractor can provide an alternative, more natural solution to your body’s chronic pain. A lot of the time, the pain stems from problems with your musculoskeletal alignment, and our chiropractors are trained to fix that alignment and ensure your body is functioning properly. You find you have a limited range of motion. When your body isn’t moving like it once did or you’re having trouble with the flexibility in your arms, neck or legs, a chiropractor can help bring your body back to its normal range of motion by realigning your bones and joints to their original placements. You’re frequently experiencing headaches and migraines. Believe it or not, your frequent headaches and migraines could be stemming from a problem linked to your neck or spinal alignment or issues with oxygen deprivation. Seeing a chiropractor could improve your blood flow and realign your spine to reduce the amount and intensity of your headaches. You were in a recent accident and are experiencing pain as a result. If you have an injury from a car or motorcycle accident, seeing a chiropractor is a phenomenal, natural way to seek care for your healing. They can help find a non-drug solution that will help treat your injury. You have sharp pains that shoot down your leg. A pinched nerve or slipped disc in your body can send sharp pains down your leg muscles, and a chiropractor can help you find the source of the pain and relieve any unwanted pressure on the nerve that is causing you pain. You live an active lifestyle. When you live an active lifestyle, you’re more prone to soreness and additional strain on your body. A chiropractor can help keep your body in a prime state so you’re always ready to perform your best in whatever activity you choose to do. You’re pursuing a healthier lifestyle. A chiropractor can provide you with the information you need to live a more health-conscious lifestyle, whether that’s through nutritional guidance, exercise or stress-relieving techniques for your body. Spinal adjustments are also a great way to help kickstart your healthy lifestyle, as they promote physical and emotional wellness. After you determine when you should see a chiropractor, how often should you see them for? That’s ultimately dependent on the extent of your pain, your condition and more. Ask our chiropractor for their professional opinion, and they will gladly be able to offer assistance. 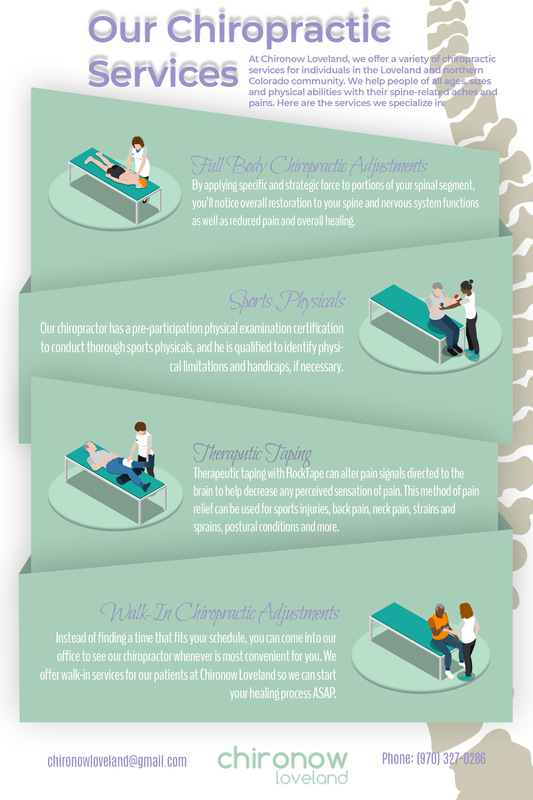 All of these are situations where seeing a chiropractor could benefit you. Luckily, at Chironow Loveland, we offer convenient walk-in services for our clients. Whether it’s your first time seeing our chiropractor or you’ve been in our office before, we encourage you to seek relief for your body’s aches and pains. Contact us today or visit our office at your convenience. Our chiropractor at Chironow Loveland specializes in several chiropractic services and offers a variety of them to our clients. Those services include full body chiropractic adjustments, sports physicals, therapeutic taping and walk-in services, all of which we offer to patients of all ages and physical capabilities. Here is some more in-depth information about the specific services we offer and who they can benefit. Our full body chiropractic adjustments cater to patients of any age experiencing several different types of pain or aches. During this service, our chiropractor will focus on several parts of your spine, as the spine is like one long chain. If there’s one kink in it, the rest won’t properly function. When we find the source of that kink and find ways to realign it, your aches and pains will gradually decrease with time. Full body chiropractic adjustments have been proven to decrease stress, improve brain clarity and function, decrease pain and aches, improve your sleep cycle and posture and more. Learn more here. At Chironow Loveland, we offer sports physicals for individuals who are living active lifestyles and require a professionally conducted physical to participate in their sport of choice. We know a general visit to the doctor for these same services can be pricey and can take time out of your already busy schedule, which is why we offer them at an affordable price and on a walk-in basis. Learn more about our sports physicals services and special offers here. Our chiropractor is RockTape Certified FMT 1 & 2, which essentially translates to us having the ability to offer therapeutic taping for our patients. RockTape is used to alleviate a variety of sports injuries and physical ailments, as it has been proven to delay fatigue and normalize muscle toning among other benefits. Learn more about our RockTape services and therapeutic taping at Chironow Loveland here. As opposed to other chiropractors in our community, we believe in offering chiropractic services at the convenience of our patients. Nobody wants to wait several days to see a professional when they’re experiencing pain today. With our walk-in business model for our chiropractic services, we hope to eliminate any doubts you have about seeing a chiropractor for your aches and pains. Learn more about our walk-in services here. As a chiropractor office in Loveland, we love helping our patients better understand chiropractic care and seeing how a chiropractor can benefit their situation. All you know is that you have pains and aches — our job is to help you understand where those pains and aches are stemming from and how we can help fix them. Here are some frequently asked questions about chiropractic services. If you have any further questions that aren’t answered below, please feel free to contact us for additional information. Q: Are chiropractic services safe? A: Yes! Receiving treatment from a chiropractor is 100 percent safe, as certified chiropractors must undergo extensive education and training to provide proper care for their patients. In fact, according to the American Chiropractic Association, chiropractic care is recognized as one of the safest drug-free, non-invasive therapies available for neuromusculoskeletal problems. Q: Can children receive chiropractic services? A: Yes! Children can see benefits from chiropractic treatment just as well as adults can. If your child has been complaining about stiffness, soreness or discomfort, we can find a solution that works best for them. Q: How long will treatment from a chiropractor take? A: Chiropractic treatment definitely requires more than a one-time fix, but the number of visits that is effective for you will depend on your particular issue. Our chiropractor will provide you with preventative care advice to minimize the number of times you have to visit our office. Q: Will my body make popping sounds? Is that normal? A: Due to the nature of adjusting and manipulating the spine, the release of gas bubbles between joints in your body can create a popping noise. It’s totally normal. But don’t worry — it’s not as painful as it might sound. There is actually minimal, if any, discomfort involved in chiropractic treatment. Chironow Loveland is a Top Rated Local® chiropractor in Loveland, and we believe in providing immediate care, attention and healing for our patients. Whether you schedule an appointment or take advantage of our walk-in services, our number one priority is to ensure you leave our office feeling better than when you first arrived. If you’ve been experiencing pain and could benefit from seeing our chiropractor, please feel free to visit our office today — no appointments or call-aheads necessary. For additional information on our chiropractic services or chiropractor, you can reach us at (970) 372-0286 or by filling out our online form.